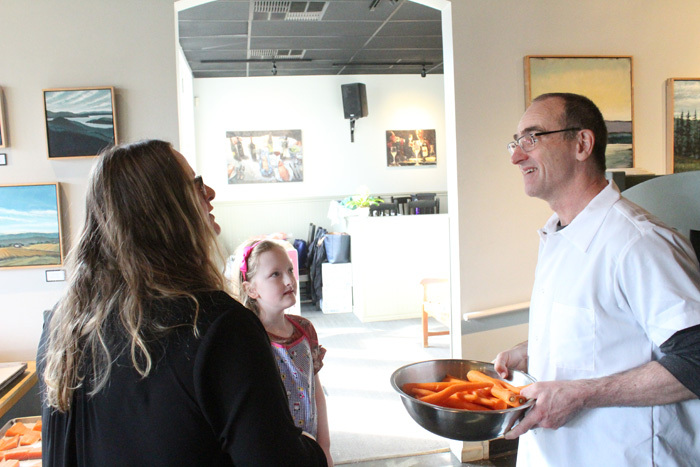 Photo by Brandon Macz: St. Clouds owner Michael McGloin talks with volunteers during the March Homeless Cooking event at the Madrona restaurant. Sixteen months after taking over the business, Michael McGloin is closing St. Clouds restaurant in Madrona at the end of the month. John Platt and Paul “Pablo” Butler opened St. Clouds in 2000, turning the bistro over to McGloin when they moved to Utah in 2017. McGloin had been a program manager at Microsoft, but left to start Judkins Street Cafe in the Central District. He had to close that business in 2014, when the property was sold for redevelopment. He tried to keep as much of the character of St. Clouds that neighborhood regulars had come to appreciate while making modest changes, but McGloin cites the loss of longtime staff, food and labor costs, and Seattle’s shortage of cooks as factors that played into his decision to close the bistro. Its last day will be Sunday, Oct. 28. “You put an ad out for a cook, and you don’t get any responses,” McGloin said. The restaurant is for sale, and he said he’d like a group to come in and take over, but he believes it will need to be something else. When he took over the business in June 2017, McGloin continued the tradition started by Platt and Butler of bringing in neighbors on the third Wednesday of the month to prepare meals for people experiencing homelessness. McGloin said he’s planning to have the last Homeless Cooking event 9 a.m. to 1 p.m. Wednesday, Oct. 17, where he hopes to discuss with community members how the program can continue after St. Clouds is gone. “It’s an effort that’s something that should absolutely keep going,” he said.